Ain't It Cool News sharpens anticipation for AX! News | Ain't It Cool News sharpens anticipation for AX! 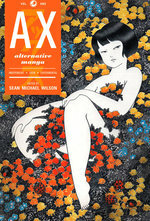 Scott Green, the anime/manga master over at nerd superblog Ain't It Cool News, is pretty excited about our upcoming release of Ax: A Collection of Alternative Manga. How excited? Well, his latest column is a 6,000-word preview-review of the book, with analyses of every artist, every story, all wrapped up in a fast-paced tour of the history of Japanese comics! You gotta check it out. His opinion? 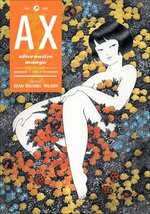 "Top Shelf's release of Ax is a giant leap forward for manga available in English... I got chills reading it." Hey, it's only natural to feel a few shivers when you're riding the cutting edge! Slice off your piece of the future -- pre-order Ax today!